Chris Johnson (center) of Wildwood Catholic High School has signed a National Letter of Intent to compete in cross country and track at Division II Chestnut Hill College. He’s joined by (from left) his father, Rob; Wildwood Catholic cross country and track coach Michael Scythes; his mother, Theresa; and his sister, Emily. 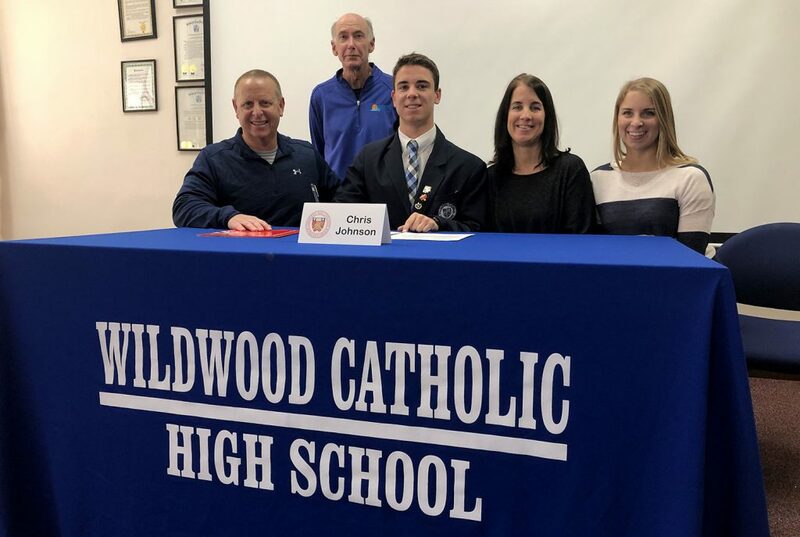 NORTH WILDWOOD — Chris Johnson has put forth a fine athletic career at Wildwood Catholic High School. The senior has been rewarded for his hard work with a substantial scholarship to continue his career at the Division II college level. Johnson, a standout distance runner in cross country and outdoor track, signed a National Letter of Intent Monday to continue in those sports at Chestnut Hill College in Philadelphia. Johnson was joined at the ceremony by his family, teammates and classmates, school administrators and Wildwood Catholic cross country and track coach Michael Scythes. Johnson is set to receive a financial package of athletic and academic scholarship money that covers more than 70 percent of Chestnut Hill’s annual tuition. He said he plans to major in criminal justice. Johnson, 18, of Wildwood Crest, has earned multiple Cape-Atlantic League all-star honors in both cross country and track. He had also considered Rider, Pace, Stockton and Jefferson before choosing Chestnut Hill. Johnson has also been a member of the Wildwood Catholic swimming team for four seasons. Johnson is the second member of his family to receive an athletic scholarship to play at the college level. His older sister, Emily, also a graduate of Wildwood Catholic, ran cross country for four years at Division I Seton Hall, graduating in 2018.